Seller: The Atlantic Monthly Group, Inc.
© The Atlantic Monthly Group, Inc. Even if I don’t close the app out I lose my place. Very frustrating with longer articles and have to find my place again. Needs to be fixed or I won’t renew. 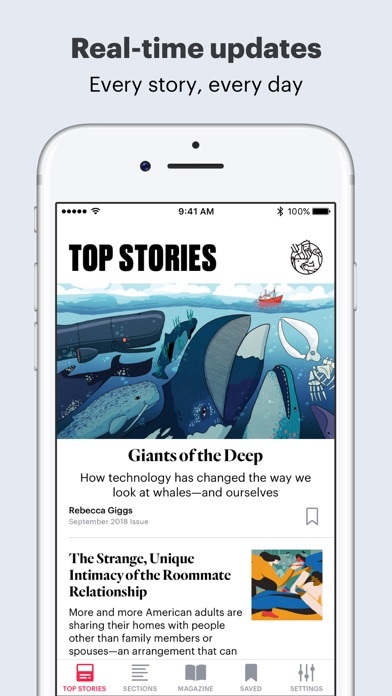 We’re having repeated issues with this app disconnecting, though we pay for the print version and are linked. It is frustrating to experience the same issue over and over, and the app crashes before we can get the logins straightened out. Just subscribed and downloaded this app—but although I can log in via browser without a hitch, the app rejects my user/password—with no information about what is incorrect. Have tried setting new password, and still doesn’t work. One of the best monthly magazines now feels like a B-minus blog. Who thought that this was a good update? Content remains excellent, but app is non-functional. Goes to white and doesn’t open. Don’t update! I subscribed to the digital version of the Atlantic. Want to read it on my phone. But after downloading the app three times now and trying to set up the subscription (why does this have to be so cumbersome? ?I I give up. The app simply freezes, or rather gives me a spinning wheel that never ends. Only solution: delete the app and try again. This doesn’t bode well. I guess I better switch to the paper version. Maybe Atlantic is too old school to be read on a phone. I've given up on trying to get the app to work on my iPad2. Maybe it has something to do with Apple's failure (refusal?) to update the OS beyond 9.3 on older iPads, although that doesn't seem to impact the functioning of any of my other pre-10 apps. But now I just patiently wait for the hard copy to arrive in the mail and carry it along with me for good reading on my plane, train, and ferry trips. I love how the app generally remembers where you are in an article. I hate how you cannot SEARCH for an article or subject. (Are we not digital here, rather than analogue?) I love how in can download magazines for reading on trips overseas and on airplanes. I hate how you cannot zoom in on an image. Just some basic functionality would make this app serve readers betters. But overall, it works. I am an online subscriber and primarily read the Atlantic on my phone. Though I sometimes switch to the website for when I’m citing for academic papers. I read wide and constantly and often things I’ve read on here I’d love to be able to flag as I go and quickly reference. Please add a highlighting and notes feature ! And the AppStore/Atlantic interplay is simple enough in terms of billing but frustrating when signing in. Thanks! Freezes on startup, reinstalling does not solve problem. Guess I will keep reading the print copy. The app is a waste of space on an iPad. I love this app. It works so well when I don’t have time to bring the print version with me, or when I’m on the go. I love that I don’t have to read the articles in a PDF type format—but instead each one is sorted into a completely digitized and easy to read version. My problem is that there is no way to save where I am in an article if I decide to finish reading it later. Every time I close the app I open it back up and I have to find where I was reading last, which is quite difficult considering that many of the articles are in long essay format. Please add a feature that remembers where I am in each article! One of the best monthly magazines now feels like a B-minus blog. Who thought that this was a good update? Content remains great...app drives me to the paper version. It keeps telling me to update App from App Store. Even after I do that it doesn't seem to work. I have the latest iOS update for my machine, (an older IPad) So for now I have no access to app. I’ve been a print subscriber for many years. I’d love to be able to reliably read Atlantic on my iPad, but I rarely do because it gives me nothing but trouble. Can’t tell you how many times I’ve paired the app with my subscription only to have it disconnect a few weeks later and force me through a cumbersome process again. For the past couple of months it gives me a blank screen when I try to pair it with my print subscription. It’s been troublesome trough so many releases that I’ve nearly given up. I come back after many months away to give it one more try, only to be frustrated again. Can’t imagine why it’s so hard for a top notch outfit to get its app right. Would it be asking too much to request a search function? The app allows you download the older version of the app that is compatible with the highest iOS available to this iPad mini but as soon as you load it the app tells you that you must update the app and you cannot use it unless you do. Not sure why it would let you download it if it's unusable. Will probably have to cancel the subscription now. My husband purchased the subscription through the app. We have family Sharing turned on and it’s an app feature. But it does NOT work. Don’t expect to share the Atlantic if you purchase through the App Store. Total rip off. You can’t even live chat to problem solve. Just get a “no account” message. Don’t purchase through the App Store. Love that one can adjust the font size on this app. My biggest frustration is losing my place while using this app: if I switch over to a different app, I lose my place in the article and/or magazine. I have been a subscriber to the Atlantic magazine for over 30 years. Today, I am lying in bed sick and I thought I would use my iPad to read the Atlantic online. I am told that it needs an update and I should go to the App Store. I go to the App Store and apparently it is already updated. I reopen the Atlantic software and I'm told I need to go to the App Store. What is the point of having all these devices if we spend our entire lives updating every app every day? What a waste of my time. No, I am not going to unsubscribe. I am just going to voice my frustration that one of the few ethical bastions of journalism is giving me the runaround with their stupid app. 1 star and never more whilst banner trashes up content. Was able to successfully link my print subscription, but cannot get any content! Have restarted app without result. This is useless as it stands! Simply put, this app is not friendly to the reader. It holds a lot of info, but the user interaction is frustrating. It needs a FULL redevelopment to support the digital based reader. I don't recall if The Atlantic charges extra for digital, but considering this app, it's not justifiable. Page place saves is crucial! To be able to return to where you keft off is a requirement, not an option. Great app and great content. Terribly buggy. Love the content, hate their app developer. This is a terrible attempt to pivot to digital distribution. No wonder readership is down. I wouldn't bother downloading this pos until they completely overhaul it. Please Atlantic, if you are listening, contact the Economist's app developer, their app works great every time. 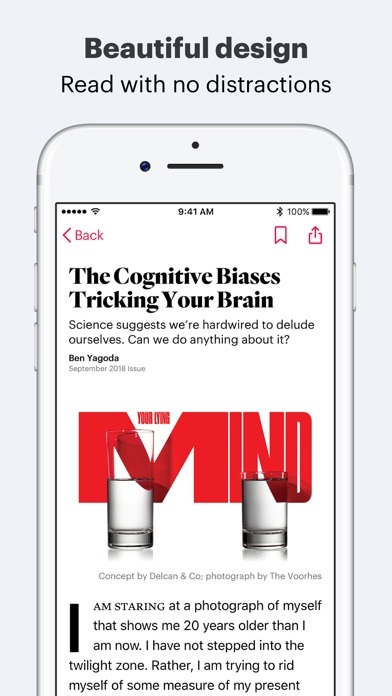 Why is it so hard to develop a magazine reading app that works? It boggle the mind. Frustrated! Worst app in the App Store? I love the magazine but there is no way I can access my issues in the app. It is in perpetual log-in -> success! -> log-in loop. Uninstalling/re-installing doesn't help. Useless!! Make a proper app or don't launch one. It's not rocket science @theatlantic. I like the articles but the phone app blows. I subscribe for the articles, and the app is fine on my iPad, but it blows my mind that this lazy developer has not yet optimized this app for the iPhone Plus screen size. Come on, I'm paying for your app, fix it. Just hire whoever did The Economist's app and go from there. This one is terrible. There has been very little thought out into the style and function of this app. I have never written an app review before but I thought I'd say something because I want read more Atlantic on my phone . My NYtimes app is probably my most used app as a result of its slick functioning. first of all, the app takes an eternity to load. But my biggest complaint is that it does not remember where I was reading when I left the app. I have to scroll through everything to find the place which, in my opinion makes it almost unusable. If I'm reading on my phone, it's usually because I have some time to kill while I am waiting and I will inevitable be it erupted in the middle of an article. Please fix this, so I can enjoy the app as much as the journalism. Thanks. As most reviewers have found, this app has long been terrible. Frequently crashes, doesn't remember where you were reading, etc. On my new iPad I now can no longer access the magazine at all. I have a print subscription, and when I log in it says 'success' but when I try to download the magazine it still wants to charge me $6.99. App has lots of bugs. Some videos won't play. Some that play have no audio. App has problems if you rotate device from portrait to landscape and vice versa. Needs work. The layout is cleaner and in general things seem a bit smoother but some loss of usability. I was using the app a couple of times a day and the ability to flick from one article to the next/prior one was very useful to me. Also the fact that articles now show up multiple times in different areas in the main screen is truly annoying. Don't know what all the fuss is about. Although, I didn't login. This app is the absolute worst piece of garbage that I've ever used. It's like a first-gen app made by a high-school student. Don't waste your time on this train wreck. Unbelievable. This is an app where audio does not work when viewing videos within the app. Disappointed. The Atlantic content is fantastic, as always. At last, the app does some justice to presenting the content. Bare bones but highly usable, stable, easy nav, article sharing and saves, newly included video content - from which I discovered Atlantic content on YouTube without leaving the app. All a long awaited relief for app users. I read another review - I disagree: I'm glad NOT to have comments and user-based data. The website is for that. Please keep the app clean! As a subscriber, I just want to read unobstructed content with nothing begging for my input or forcing me to work around others'. I work with the articles - save, share, get info from to other sources, quote from for blog posts and discussion. It's nice to open the app instead of just glancing at the Atlantic icon on my iPad and going to the website. I kept the app as a reminder (I enjoy a lot of sources and I lose track). Big thanks to the devs for the desperately needed update! 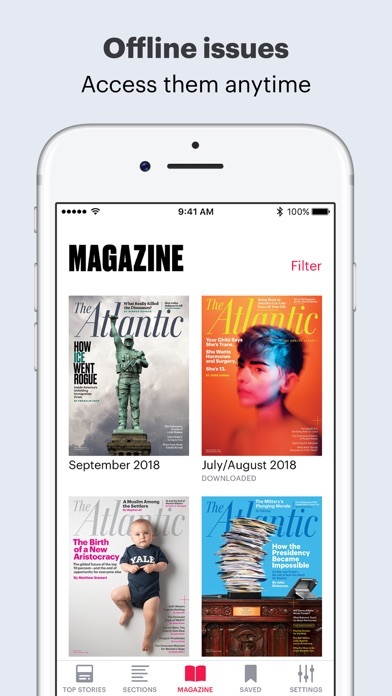 I would really like to be able to use this app to read The Atlantic, but it is lacking virtually all of the features of a decent magazine app. It's impossible to find an article, it's impossible to share an article, login settings don't work... In short, completely worthless. I'm in the same boat with most of the other one star raters. It's incredibly frustrating to have to find your mailing label every time they decide to update the app. As someone else already said, I'm traveling and using the app, therefore I didn't bring a hard copy with me. That's much of the point of using it. I love the new app set up and it feels like most other good news apps I have used. The only minor issues I would like added/fixed are a search function for past articles and to have your saved articles carried over or attached to your account so they are not wiped for major updates. I am not sure if that was because of the major redesign this time but it is an annoyance. The Atlantic app was one of my most used. I love the style. Most trusted source of news and analysis. From time to time I would buy the digital issue through the app if something interesting was behind the paywall. Now I have to subscribe to view what was free, and what is still free through the web experience? Mind boggled. Delete. Introducing a pay wall is neoliberalism incarnate. The Atlantic famously decries they are "of no party or clique." If this were truly the case there would be no pay wall for using the app. The subscription is affordable enough for me but I do wonder if it is affordable for everyone. Why should news be only for those who can pay for it? If the app followed the design of the mobile website, 99% of my complaints would be resolved. I just use the mobile website, this app is such a waste. Not sure why this app totally disregards decisions made for the flow of the pc and mobile websites. Totally disjointed. For the content (and the magazine's editor's writing on foreign policy in particular), The Atlantic is as important and relevant as ever. The app is however poorly designed, making the actual magazine and web articles hard to find and search. Too bad. 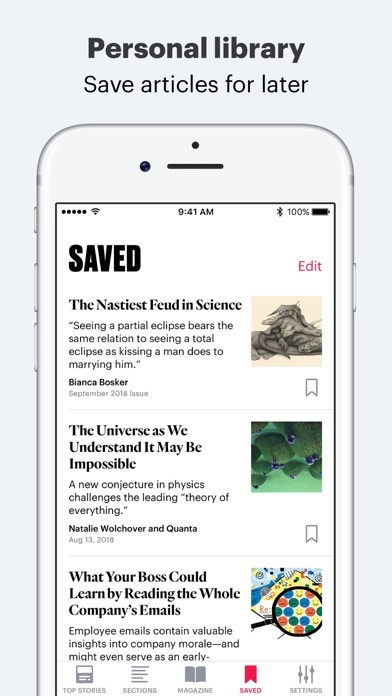 This new app is a world apart from the old one—it's clean, fast, and a delight to use. Kudos to the Atlantic's digital team! After the update the app became for subscribers ONLY. What a fine idea! I'm better off deleting the app and accessing the magazine online. Awful app. Can't even log in. The process of subscribing to a digital-only account is made chronically frustrating by a poorly designed and implemented website and app. Although I received email confirmation, I am unable to log in to the Atlantic iOS app. Not worth the aggravation. Just requested a refund. They are holding back a few bucks to cover the print edition they allegedly already sent. (I ordered a digital-only subscription). This could be a good app. It offers large print. You can have the story read to you as you read along. Yet, you have to get in. I have subscribed to the Atlantic for decades. I love the Atlantic. Yet, I cannot access a story on this app 98% of the time. I open the app. I am offered the chance to buy the latest issue, a story, or to subscribe. I get a magazine and copy my subscription number into the place provided. They then tell me I am already a subscriber. I find the story I want, try to open it -- and I am taken straight back to those 3 choices. When I get in. -- hooray!!! -- i have no idea how or why the app let me in. It is endless. Why bother letting people listen along when they 98% of the time they cannot access the written material? It seems like fixing that, fixing access to subscribers, would be more important. The new version of the app is a huge improvement. 5 stars if you synced bookmarked articles across devices. Paying for a subscription to read articles in the app when you can read the same content on their website for free is throwing your money away. Make the app a one time nominal fee to download and I would've considered it, but requiring a subscription for what you can get elsewhere for free is sheer stupidity. One of the best magazines ever; one of the worst apps ever. C'mon, people, hire the guy who the New Yorker app. I've spent almost the same amount of time trying to get the app to work as I have reading the magazine. New version of app requires iOS 10, but for those stuck at iOS 9 (original iPad Mini), last 'compatible' version of app is offered, but then this pops up 'update required' over and over after you launch the app, until you give up. This is a sucky way to handle this - just tell your users of barely-obsolete tech upfront that they can piss off. On my iPhone 7+ with iOS 10, I saved 3 articles to read offline later. When I went to read them offline, I was told no articles were saved. In settings, however, it says I have saved 3 articles using a total of several MB. So they are there but not accessible. Frustrating. Other than that sore point, I’m generally happy with the app. Love the content. Works fine on my iPhone, with iOS-10, but not on iPad which for some reason I can't upgrade to iOS-10. Running on an older iPad. OS 9.3.5. App keeps showing "Go to App Store" message with OK button. Click OK and shows a brief updating app progress bar and message reappears. Deleted app and tried restoring from the App Store. Said the app requires OS 10 something, but could load an earlier version of the app. Clicked OK, but when the app opened got the same message as before, "Go to App Store" with OK button. Don't pretend that your changes won't have an impact. If you aren't truly going to support your app on older devices, just say so. I like the new app interface. But a major annoyance is that the app forgets my subscriber credentials when it updates. Please fix. Now requires iOS 10, and I only get 9.5. Guess I'll drop my subs to this elitist screed when my subs expires! Still asking me for login details. Even though I have a print subscription that I have linked to the app, there appears to be no option to select appropriately. I didn’t buy via iTunes; I am a print subscriber BUT I have used the app before. In any case, selecting this option takes me to a blank screen. Infuriating. Meanwhile, the Atlantic sends me ludicrously early reminders to renew my subscription, which doesn’t expire for another year at least. How hard can it be to fix this? 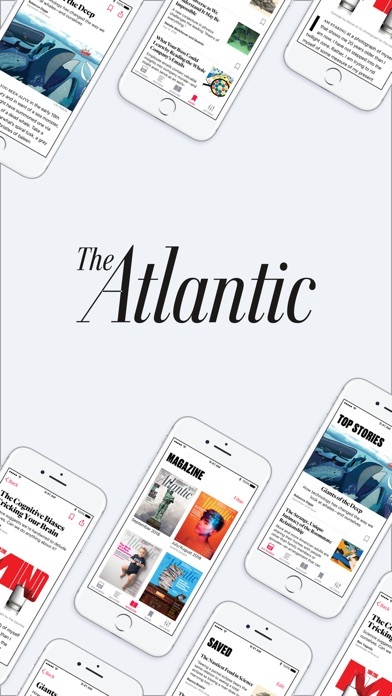 Update: since the iOS update it’s no longer possible to log into the Atlantic app as a subscriber. You just get a blank screen. What’s the point of subscribing. I don’t want to read the paper magazine only! Fabulous magazine, great content. App has some pain points. First, I periodically and mysteriously get logged out of the app and logging back in is a huge hassle. Be great if I could just stay logged in. Second, if I flip the screen all the text gets smushed together and weird, and the only way to fix it is to completely shut down the app (not just close, but force quit). Third, if I close my iPad or power off with the app open, the text gets all wonky and the app has to be force quit to reset. Once app updated I was unable to view content until my print subscription was linked. If instructions are followed You get a blank page without any way to actually complete the linking process. Emailed support twice with no response. App is now useless. Bring back the old app! This is almost there, id just like to not ha e to try to relink my account over and over. Also loved that you used to predownload articles, flip to airplane mode and still read. The latest UI overhaul caused major login issues. Latest smaller update didn't fix any issues linking to my Atlantic subscription. By garbage technology that prevents subscribers from reading articles. No more collection of rib-tickling gender stories en mass. Why such a buggy app? Asks me to link subscription. Click to do so and up pops an empty window. No access via the app. Hoping to finally be able to view my subscription and The Atlantic's articles on my iPad, but no such luck. This app is worthless. Anytime you are off the Internet for more than an hour, the app dumps all your saved stories and freezes when you try to look at one of the downloaded magazines. But even more frustrating, all of the saved stories are still in your iPad's memory, you just can't get to them. In other words, this app has a significant memory leak. Your only option is to delete all the saved stories...which you couldn't get to anyway. The money you've paid for your digital subscription is wasted. Unfortunately I signed up for daily emails, and now cannot stop them coming. Theoretically great... if you could actually get to the content you’ve paid for. Figure it out. You used to be able to read stories without a subscription. You only needed that for the magazine articles. Now to access anything you need some type of subscription. For what it's worth you can still access Atlantic stories through the Apple news app. Why did you destroy a good thing? I opened my app, and got a screen msg telling me to update my app. I went to do just that and there is no update to be had. I preferred reading the magazine through my app, and accessing the articles there as well, as opposed to the website. Fix this, or risk losing a subscriber. My impression of the magazine business is that paid subscribers are a valuable commodity. Pay attention to them. There are enough bad reviews here to learn from. Open the Atlantic Mag today 10-04-2017 and you will receive "Update Required " message. You can't open the app ever again. Check your software under Settings - General - Software Update, and you will have the latest version of 9.35 on your iPad 2. Call into Atlantic Mag Customer Service, get transferred twice, and they will tell you that you must have IOS 10. This is the 1st time I that was effectively told me that I must buy a new IPad to continue accessing my paid subscription. Terrible way to treat a long time customer subscriber. Happy again with this. Have always been happy with The Atlantic. Thanks for the follow up. I’ve been a print subscriber for many years. I’d love to be able to reliably read Atlantic on my iPad, but I rarely do because it gives me nothing but trouble. Can’t tell you how many times I’ve paired the app with my subscription only to have it disconnect a few weeks later and force me through a cumbersome process again. For the past couple of months it gives me a blank screen when I try to pair it with my print subscription. It’s been troublesome trough so many releases that I’ve nearly given up. I come back after many months away to give it one more try, only to be frustrated again. Can’t imagine why it’s so hard for a top notch outfit to get its app right. Downloaded app on iPad. Says update required visit App Store. Go to App Store. All it says is Open. No update option. Nice app. I’m a magazine subscriber and since the newest release I haven’t been able to read the articles offline on my iPad. The app works well when connected to WiFi but if you’re like me and use your iPad for reading on flights then it’s a complete waste of time. I’ve been hopeful they were going to release a fix by now and I’ll change my review/rating as soon as this major flaw is fixed. Everything else is fine, BUT NO SEARCH FUNCTION!! This is absurd in 2018 and I hope the fix it soon. I can't get new subscription or my archived versions. How hard can this be? Seriously. If you own an iPad three years or more old, it doesn't upgrade to 10, so no more access to The Atlantic. You just lost a big audience. No longer works on my I-Pad. Tells me an update is required but none is available. Has been this way for more than two months. unacceptable, especially for a paid subscription!